A little introduction about the NAEMSP and NREMTs role in it. Oral Presentation at the annual meeting of the National Association of Emergency Medical Services Physicians / January 24-26, 2017 Prehospital Emergency Care January/March 2017 Vol. 21 No. 1 p.91. Accredited Paramedic Program Graduates Have Higher Student Ability Estimates. Severo A. Rodriguez, PhD, NRP, Remle P. Crowe, MS, NREMT, Rebecca E. Cash, MPH, NRP, Ashish R. Panchal, MD, PhD. Rebecca E. Cash, MPH, NRP, Remle P. Crowe, MS, NREMT, Severo A. Rodriguez, PhD, NRP, Roger Levine, PhD, Ashish R. Panchal, MD, PhD. 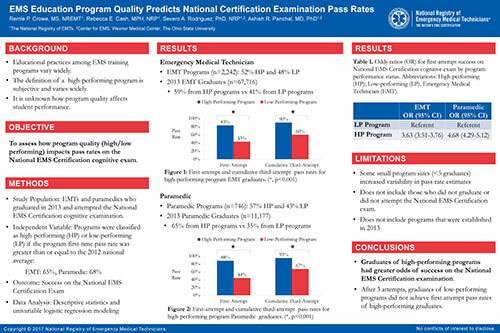 EMS Education Program Quality Predicts National Certification Examination Pass Rates. Remle P. Crowe, MS, NREMT, Rebecca E. Cash, MPH, NRP, Severo A. Rodriguez, PhD, NRP, Ashish R. Panchal, MD, PhD. 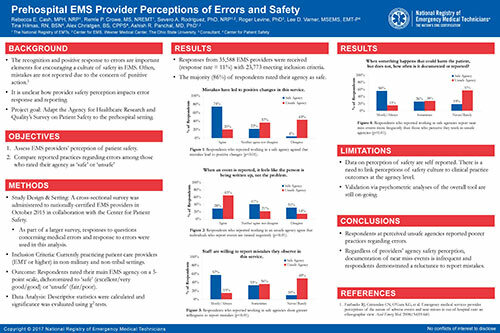 Factors Predicting a Negative Perception of Patient Safety in the EMS Workplace. Rebecca E. Cash, MPH, NRP, Remle P. Crowe, MS, NREMT, Severo A. Rodriguez, PhD, NRP, Roger Levine, PhD, Lee D. Varner, MSEMS, EMT-P, Tina Hilmas, RN, BSN, CPPS, Alex Christgen, BS, CPPS, Ashish R. Panchal, MD, PhD. Leaving and Returning to EMS: Why Providers Leave and Characteristics Associated with a Desire to Return. Riddhima Agarwal, BS, Rebecca E. Cash, MPH, NRP, Remle P. Crowe, MS, NREMT, Severo A. Rodriguez, PhD, NRP, Ashish R. Panchal, MD, PhD. Based on this call, the NREMT established a Research Department and founded the EMS Research Fellowship program to address the National Research Agenda’s recommendation. The vision of the NREMT Research Department is to develop and foster EMS-prepared doctoral researchers to function with the highest level of scientific integrity to improve and ensure high quality and innovated NREMT products and processes through evidence and collaboration. It is further the mission to contribute to the body of scientific out-of-hospital knowledge to improve the competency, health, safety and wellness of EMS professionals and the patients they serve. The research department is overseen by the Research Director and advised by the NREMT Board of Directors’ Research Committee, which includes physicians, experts in the field and PhD researchers. This committee meets annually. Unique to the EMS profession, the EMS Research Fellowship provides an opportunity for practicing EMS professionals to pursue a doctoral degree while actively contributing to the body of out-of-hospital knowledge. NREMT Research Fellows are full-time employees of the NREMT and receive fully funded tuition towards completion of an approved doctoral program at The Ohio State University. Crowe RP, Levine R, Rodriguez S, Bentley MA (2015). A Description of Patient Care Feedback in Prehospital Emergency Medical Services. Poster presentation at the annual meeting of the National Association of Emergency Medical Service Physicians. 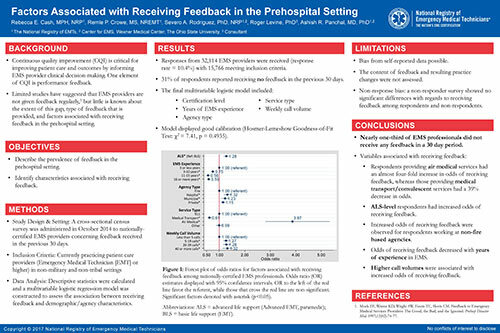 The objective of this study was to describe the prevalence and source of different types of feedback in the prehospital setting. In total, 24,219 respondents met inclusion criteria. A total of 54.6% of individuals received feedback on medical care provided, 42.2% on patient outcomes, 41.3% on documentation and 32.0% on patient satisfaction. Respondents received feedback regarding medical care on a median of 2 of their last 10 calls, most of which originated from a partner/crewmember (75.3%) or a supervisor (55.1%). Meanwhile, the most common source of patient outcome feedback was staff at the receiving facility (66.2%). According to respondents, most EMS employers tracked a patient’s continued care only sometimes (49.2%) or never (26.8%). Crowe RP, Rodriguez S, Bentley MA (2015). A National Description of Mobile Integrated Healthcare Providers. Poster presentation at the annual meeting of the National Association of Emergency Medical Service Physicians. The objective of our study was to assess the national prevalence of MIHPs and to describe their practice. We hypothesized that a greater proportion of MIHPs would perform scheduled or non-emergency tasks than non-MIHPs. A total of 14.5% of paramedics reported functioning as an MIHP. More MIHPs worked in rural communities of less than 25,000 residents than non-MIHPs (42.6% vs. 29.6%,p<.001). As part of scheduled follow-up, 21.9% of MIHPs had performed a psychosocial needs assessment, 21.5% had performed an in-home assessment of frequent 9-1-1 users, and 15.1% had performed a home safety assessment compared to 8.1% (p<0.001), 13.3% (p = 0.001), and 6.6% (p<0.001) of non-MIHPs, respectively. Nearly a quarter of MIHPs had managed chronic wounds (23.7%) compared to 9.5% of non-MIHPs (p<0.001). More MIHPs had performed a scheduled wellness visit after hospital discharge (14.9% vs. 3.7%, p<0.001) and coordinated care with a patient’s nurse (14.9% vs. 4.1%, p<0.001) or physician (13.2% vs. 3.9%, p<0.001). Crowe RP, Levine R, Rodriguez S, Bentley MA (2015). Ambulance Safety Then and Now: A Longitudinal Paradigm Shift. Poster presentation at the annual meeting of the National Association of Emergency Medical Service Physicians. Our objective was to assess and describe a ten year change in components related to collisions involving emergency vehicles and ambulance safety habits. The prevalence of reported ambulance collisions decreased by 0.4% (6.9% in 2004 and 6.5% in 2014). At the time of the collision a greater proportion of respondents were in the driver’s seat (48.8% in 2004 and 40.7% in 2014). There was a substantial decrease in collisions while using lights and sirens from 43.5% in 2004 to 25.4% in 2014. Ten years ago, 17.3% of individuals received medical attention after an ambulance collision compared to 10.2% in 2014. Lastly, ambulance seatbelt use in the patient compartment increased from 10.0% of individuals who wore seatbelts either always or nearly always in 2004 to 26.7% in 2014. Bentley MA, Foraker R, Anderson SE, Shoben AB, Crowe RP (2015). A National Assessment of Cardiovascular Health among EMS Professionals. 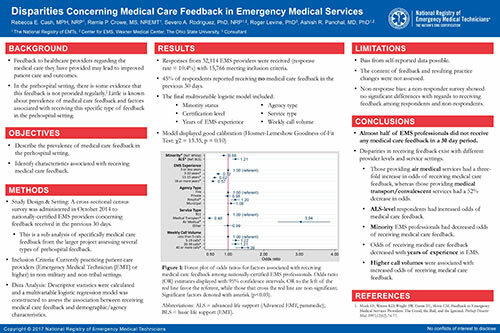 Poster presentation at the annual meeting of the National Association of Emergency Medical Service Physicians. The objective of our study was to describe the CVH of a national cohort of EMS professionals. A total of 1,102 (42.7%) individuals completed the questionnaire. While no EMS providers scored poor on all of the CVH indicators, only 5.5% scored ideal on all six. Most individuals had ideal CVH in the following components: glucose (ideal 71%, intermediate 26%, poor 3%), cholesterol (ideal 69%, intermediate 27%, poor 4%), smoking (ideal 64%, intermediate 21%, poor 15%), and exercise (ideal 56%, intermediate 8%, poor 36%). Meanwhile, a minority of individuals had ideal CVH in blood pressure (ideal 38%, intermediate 56%, poor 6%) and BMI (ideal 32%, intermediate 35%, poor 33%). Crowe RP, Levine R, Bentley MA (2014). An Assessment of Prehospital Helicopter EMS Access and Training. Poster presentation at the Texas EMS Conference. The objectives of this study included describing EMS professionals’ access to and utilization of HEMS for specific patient types (trauma, non-traumatic chest pain, stroke, and pediatric). We assessed decision-making criteria for HEMS use and the prevalence of HEMS-related training among EMS professionals. Finally, we looked for characteristics of EMS professionals related to having received HEMS training within the past 24 months. Most EMS professionals (90.2%) had access to at least one HEMS service, while slightly fewer had the authority to request these resources (86.0%). In the past 12 months, a typical EMS professional utilized HEMS most frequently for trauma patients with an average of 4.5 transports (SD 6.6) and least frequently for pediatric patients with 0.9 transports (SD 2.4). As for criteria that impact the decision to use HEMS for trauma patients, nearly all respondents reported that time to the nearest trauma center (94.5%) and mechanism of injury (93.7%) were important. Nevertheless, not all EMS professionals are receiving training in HEMS utilization and safety as only two-thirds received training in at least one of these HEMS-related topics within the past 24 months. Multivariable logistic regression modeling indicated that females (OR 0.75, 95% CI 0.66-0.86) and EMS professionals working in urban environments (OR 0.70, 95% CI 0.62-0.78) were less likely to have received HEMS training. Individuals practicing at the Advanced Life Support levels (OR 1.27, 95% CI 1.13-1.43) were more likely to have received HEMS training. Bentley MA, Rodriguez S, Crowe RP (2014). The National Defense Authorization Act: Military to Civilian EMS Provider Transition. Poster presentation at the Texas EMS Conference. The objectives of this study were to (1) describe the number of military personnel who have obtained National EMS Certification and (2) estimate how long members of the military maintain this certification. A total of 63,157 military personnel obtained National EMS Certification between January 1, 2007 and June 30, 2014 (50,451 Army; 10,210 Air Force; 2,496 Navy). Of those, 74% of Army, 83% of Air Force, and 34% of Navy personnel currently possess National EMS Certification. Further, the probability of maintaining National EMS Certification for 4 years, 5-6 years, and 7 or more years was the highest for the Air Force (82.3%, 68.2%, 59.5%, respectively) followed by Army (72.2%, 47.2%, 32.4%, respectively) and Navy (30.8%, 20.0%, 17.2%, respectively). Crowe RP, Bentley MA (2014). Improving an Online Continuing Education Validation Algorithm. Poster presentation at the annual meeting of the National Association of State EMS Officials. Between October 2012 and March 2013, the National Registry of EMTs (NREMT) renewed the National EMS Certification of more than 85,000 EMS professionals. Due to the overwhelming number of individuals who submitted electronically during the 2012-2013 recertification period, the average processing time of an online application was nearly 26 hours. The NREMT sought to identify and implement measures to decrease the average application processing time during the 2013-2014 recertification period. Key indicators of application completeness were identified and a new algorithm targeting these components was implemented before the start of the 2013-2014 recertification period. While identifying key indicators, investigators concurrently documented the most frequently entered EMS courses for continuing education on recertification applications. These common courses were incorporated into a drop-down menu that the applicant could utilize while filling out his or her application. Further, the algorithm was able to detect specific characteristics of the drop down menu courses to ensure appropriate allocation of hours. With the new algorithm implemented, the processing time of applications was reduced by 55.1% from an average of 25 hours and 23 minutes during the previous year to 11 hours and 24 minutes. The number of incomplete applications was reduced by 58% while reducing the need for manual entry by the applicants or their Training Officers who could select common courses from the new drop-down menu. Crowe RP, Eggerichs JJ, Gormley M, Rodriguez S, Bentley MA, Levine R (2014). A Description of Violence towards Emergency Medical Services Professionals. Poster presentation at the annual meeting of the National Association of Emergency Medical Service Physicians. Our objective was to describe the prevalence of and identify characteristics associated with violence towards EMS professionals. Responses were received from 2,579/4,238 (60.8%) individuals, with 1,780 reporting having worked in EMS in the last year. Over two-thirds (68.0%) reported having experienced violence in the past 12 months. Of these individuals, 70.3% were male, 17.8% were volunteers, and 57.0% worked in urban communities (>25,000 people). Private agencies employed the highest percentage of those who experienced violence (41.5%), followed by fire departments (29.2%). The mean years of experience for EMS providers who encountered violence was 5.35 (95% CI 5.0-5.6) compared to 4.12 (95% CI 3.6-4.6) for those who did not. Mean weekly call volume was 17.7 (95% CI 16.9-18.5) for those who experienced violence compared to 8.4 (95% CI 7.5-9.2) for those who did not. All variables reported were statistically significant. Crowe RP, Eggerichs JJ, Rodriguez S, Bentley MA (2014). Defining Components of Teamwork in Prehospital Emergency Medical Services. Poster presentation at the annual meeting of the National Association of Emergency Medical Service Physicians. The objective of this study was to identify specific components of both team leadership and followership in the context of prehospital EMS. All ten EMS experts participated in this study (10/10; 100%). After completing the seven-step NGT process, eight components of team leadership and eight components of team followership were identified. Team leadership components included 1) creates an appropriate action plan; 2) receives, processes, verifies, and prioritizes information gain from team members; 3) communicates; 4) demonstrates confidence, maturity, compassion, and command presence; 5) reconciles incongruent information; 6) is willing to take charge; 7) is accountable for team-actions/outcomes; and 8) assesses the situation and resources and modifies the plan. Team followership components included 1) demonstrates followership; 2) is capable of appreciative inquiry; 3) is situationally aware; 4) does not freelance; 5) communicates; 6) ACCURATELY performs assigned tasks in a timely manner; 7) is safety conscious/ advocacy; 8) leaves ego and rank at the door. Bentley MA, Eggerichs JJ, Rodriguez S, Crowe RP (2014). The Demand for Emergency Care: Supply of EMS Providers and the General Populace. Poster presentation at the annual meeting of the National Association of Emergency Medical Service Physicians. Our objective was to describe the number of EMS professionals per 10,000 members of the general populace. Eight states require both initial and national recertification. The average total number of providers was 28.7/10,000 state populace (range: 11.4-46.4). With respect to certification level, the average number of first responders was 1.6/10,000 state populace (range: 0.02-5.4), EMT-basics was 19.5/10,000 state populace (range: 5.2- 34.8), EMT-intermediates was 2.5/10,000 state populace (range: 0.3-10.5), and paramedics was 5.1/10,000 state populace (range: 2.8-6.4). Eggerichs JJ, Blau G, Bentley MA (2013). Work Exhaustion Associated with Personal and Work-Life Characteristics among Nationally Certified EMS Professionals. Poster presentation at the annual meeting of the Journal of Emergency Medical Services. The objectives of this study were to characterize work exhaustion in a cohort of nationally certified EMS professionals and to determine if work exhaustion was associated with personal and work-related characteristics among nationally certified EMS professionals. In 2010, a questionnaire was sent to all nationally certified EMS professionals eligible for recertification. A 3-item work exhaustion scale was used to assess work exhaustion (Strongly Agree=1 to Strongly Disagree=6). A summation of all three items divided by three was used to compute the outcome variable. This questionnaire also contained previously validated demographic and work-life characteristics. Multivariable linear regression modeling was used to test the study hypothesis (α=0.05). A total of 24,586 (33.9%) people completed the questionnaire. The majority of respondents were EMT-Basics (50.9%), male (73.3%) and had an average age of 40 (SD=10.5). Respondents reported high disagreement of work exhaustion (mean=5.28, SD=0.93). As years of experience increased and job satisfaction decreased, work exhaustion increased in this population. Likewise, those people who did not volunteer reported less work exhaustion. Key EMS stakeholders should focus attention on these predictors to monitor those people at a higher risk of work exhaustion. Bentley MA, Fernandez AR, Studnek JR (2012). Predictors of Stress among Nationally Certified EMS Professionals. Oral presentation at the annual meeting of the Society of Academic Emergency Medicine. The objectives of this study were to estimate the prevalence of stress and to describe predictors of stress among nationally certified EMS professionals. The overall prevalence of stress was estimated at 5.9%. The odds of stress in paramedics was 32% higher when compared to EMT-Basics (OR=1.32, 95% CI=1.23-1.42). When compared to ≤2 years of experience, individuals with 3-7 years (OR=1.10 95% CI=0.89-1.36), 8-15 years (OR=1.56, 95% CI=1.24-1.95) or ≥16 years (OR=1.67, 95% CI=1.28-2.18) were more likely to be stressed. EMS professionals working in county (OR=1.28, 95% CI=1.07-1.51), and private services (OR=1.35, 95% CI=1.16-1.56) were more likely than those working in fire-based services to be stressed. Lastly, as perceived general health declined odds of stress increased; excellent general health was compared to very good (OR=1.60, 95% CI=1.35-1.91), good (OR=2.74, 95% CI=2.30-3.28), and fair/poor health status (OR=6.09, 95% CI=4.53-8.17). Gibson GS, Eggerischs-Purcell, Bentley MA (2012). Protecting the Public: Public Perception of EMS workforce Screening and Licensure Removal. Oral presentation at the annual meeting of the Journal of Emergency Medical Services (awarded best oral presentation). The objective of this study was to look at data collected on the public’s expectations regarding pre-employment screening and license removal for EMS professionals. 1,051 respondents completed the survey (response rate = 62.3%). Highest agreement on pre-hire screening was for illegal drug use, and the lowest was physical fitness. Highest agreement for license removal was for stealing from a patient, and the lowest was for improper patient care. Findings indicate public support for pre-hire screening and for licensure removal. Eggerichs-Purcell J, Bentley MA (2012). Demographic and Work-life Characteristics Associated with Overall Job Satisfaction among Nationally Certified EMS Professionals. Poster presentation at the annual meeting of the Journal of Emergency Medical Services. The objective of this study was to determine if overall job satisfaction was associated with demographic and work-life characteristics among Nationally Certified EMS Professionals. There were 593 (91.5%) EMS Professionals classified as satisfied with their overall job. When looking at overall general health, 363 (62.4%, p=0.001) of the people that were satisfied also had good health. With respect to service type, job satisfaction was highest (60.9%, p=0.036) in governmental versus nongovernmental services. Those working primarily emergency calls were most satisfied when compared to those working scheduled transports and both emergency and scheduled calls, (85.9% versus 5.6% and 8.9%, respectively, p=0.001). An average age of those reporting satisfaction was 40.5 years (SD=11.5) versus unsatisfied being 36.3 years (SD=10.4). Eggerichs-Purcell J, Gibson, GC (2012). Public Perception and Value of EMS Compared to Other Public Service Entities. Poster presentation at the annual meeting of the Journal of Emergency Medical Services. The objective of this study was to assess the public’s perception and value of EMS when compared to other public service entities. 1,041 respondents completed the survey (62.3%). The majority of individuals were willing to pay the same for EMS when compared to both police and fire services (63.7% and 69.7%, respectively). The majority of respondents also reported that EMS is equally important when compared to police and fire (74.4% and 79.5%, respectively). While the public acknowledges EMS is as equally important to both fire and police services, they are more willing to cut funding to EMS before fire and police. Gibson GS, Sahni R, Bentley MA (2011). What do we know about EMS Training Officers? Poster presentation at the annual meeting of the National Association of Emergency Medical Service Physicians. The study reports on demographic, work, and training characteristics of EMS Training Officers (TOs). With respect to demographics, TOs are primarily male (78.8%), white (88.9%), and have completed some college (49.0%). The majority are paramedics (58.5%), who have taken an EMS instructor course (63.8%), and are in paid full-time positions (65.1%). On average, TOs have worked 18.6 years in EMS (SD = 8.7). In terms of being satisfied with their positions as TOs, on a scale from 1 (very dissatisfied) to 10 (very satisfied), the mean satisfaction was 7.6 (SD = 1.9). With respect to TO training, 15.1% reported no training, 25.0% reported in-service education from previous TO, 37.6% indicated utilizing an educational method, 43.1% took an EMS instructor course, and 14.7% reported other methods. Gibson GS, Bentley MA, Sahni R (2011). Examining the Amount and Types of Contact Medical Directors have with their EMS System Training Officers. 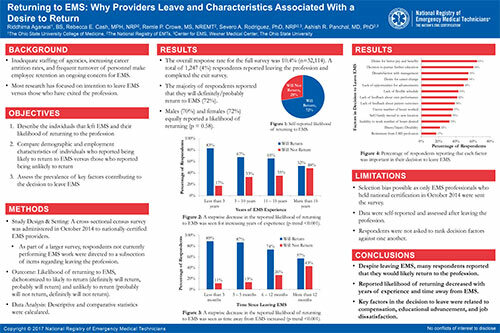 Poster presentation at the annual meeting of the National Association of Emergency Medical Service Physicians. This study examined the amount and types of interaction Medical Directors (MDs) have with their Training Officers (TOs), and further examined if these interactions varied significantly by service type. In a typical week, TOs reported interacting with a MD a median time of 12.0 minutes (SD = 85.1). Significant differences exist between this interaction and service type (F= 4.19, p-value <0.001) with fire-based services having higher md interaction than hospital-based (mean difference=-33.6, p=0.002). face-to-face interaction was the most common (median=5.0, sd=61.1), followed by e-mail (median=5.0, sd=37.2), and telephone (median=3.0, sd 26.5). with respect to service types, hospital-based services had the highest percentage of lecture (50.0%, p-value=0.002), run reviews (75.0%, p-value <0.001), protocol revisions (84.1%, p <0.001), ride alongs (17.7%, p-value=0.004), while private not-for-profit had the highest percentage for other tasks (14.0%, p-value=0.008). Fernandez AR, Bentley MA (2011). A Survey-based Assessment of the Influence of Shift Length and Sleepiness on Error-Related Events in EMS. Poster Presentation at the annual meeting of the National Association of Emergency Medical Service Physicians. The objectives of this study were to 1) quantify error-related events in EMS and 2) assess the relationship between shift length, sleepiness, and error-related events. Of the 1,069 answering the difficulty remembering protocols item, 249 (23.3%) answered yes. Of the 1,071 answering the incident report item, 25 (2.3%) answered yes. When combined, 24.4% (261/1,069) reported an error-related event. The final multiple logistic regression model revealed that the odds of an error-related event for those working ≥24 hour shifts were 1.72 (95% Confidence Interval=1.22-2.42) times that of someone working <24 hours. furthermore, for every point increase in ess, the odds of an error-related event increased 16% (odds ratio=1.16; 95% confidence interval=1.12-1.20). the final model demonstrated good fit as indicated by the hosmer-lemeshow goodness of fit test (p-value=0.1772). Bentley MA, Fernandez AR, Braithwaite SA (2011). Perception of Ambulance Diversion among Nationally Certified Emergency Medical Services (EMS) Professionals. Poster Presentation at the annual meeting of the National Association of Emergency Medical Service Physicians. The objectives of this study were to 1) Describe EMS provider perception of the patient and system-level effects of crowding and ambulance diversion and 2) Describe the frequency of these effects and any correlation with system type. 61.7% of individuals reported ambulance diversion in their area in the past 12 months. Those working for fire-based services reported the highest frequency of working in areas that allowed ambulance diversion (fire-based 40.1%, private 25.3%, other services 18.5%, municipal 16.1%, p-value <0.05). a higher percentage of those with a typical call volume of 10-39 calls in a week reported ambulance diversion when compared to lower and higher call volumes (10-39 calls 52.5%, 0-9 calls 39.0%, ≥8.5%, p-value <0.05). perceived patient care impacts noted occasionally, frequently, or often due to diversion included prolonged patient pain (26.8%), deterioration of vital signs (6%), prolonged transport time (29.5%), and delay in patient turnover time at hospital (48.1%). Bentley MA, Fernandez AR, Studnek JS (2011). Predictors of Anxiety among Nationally Certified EMS Professionals. Poster Presentation at the annual meeting of the National Association of Emergency Medical Service Physicians. The purposes of this study were to estimate the prevalence of anxiety among EMS professionals and to describe predictors of anxiety. 6.0% of participants were determined to be anxious. When compared to excellent general health, those who reported very good (OR=1.84, 95% CI=1.52-2.21), good (OR=3.88, 95% CI=3.23-4.67), and fair/poor health status (OR=10.81, 95% CI=8.14-14.34) were at a higher odds of being anxious. When compared to EMT-Basics, the odds of anxiety among paramedics was 1.14 (95% CI=1.08-1.21). EMS professionals working in county (OR=1.71, 95% CI=1.45-2.03), private (OR=1.64, 95%CI=1.41-1.91), and hospital-based services (OR=1.51, 95% CI=1.25-1.82) were all more likely than those working in fire-based services to be anxious. The odds of anxiety among those EMS professionals who reported no exercise in the past month was 1.56 (95% CI=1.35-1.80) times the odds of anxiety among those who did exercise. Bentley MA, Studnek JS, Gibson GS, Fernandez AR (2011). Identification of Components Related to Initial Prehospital Clinical Competency. Poster Presentation at the annual meeting of the National Association of Emergency Medical Service Physicians. The objective of this study was to identify components used by field training officers to determine that an entry level paramedic has reached a level of clinical competency such that they can practice independently. Seven out of ten randomly selected EMS systems participated in this study. After completing the seven step NGT process, seven components of clinical competency were identified: 1) demonstrates the ability to assess and appropriately treat a patient; 2) expresses character through actions; 3) possesses the ability to accurately document patient care; 4) shows patient advocacy; 5) demonstrates the ability to perform as a team leader consistently; 6) exhibits safe practices; 7) direct observation of correct skill performance. Gibson GC, Bentley MA, Pirrallo R (2011). Public Perceptions of 9-1-1 Field EMS: National Implications. Poster Presentation at the annual meeting of the National Association of Emergency Medical Service Physicians. This study examines the public perception of six issues thought to influence a decision to call 9-1-1. Six factors were rated for how strongly certain factors may influence a decision to call 9-1-1 (percentage “agree to call EMS” are reported): (1) patient care capabilities of the ambulance personnel (64.8%); (2) cost of services provided (37.9%); (3) severity of my illness (82.7%); (4) severity of my injury (84.4%); (5) proximity of hospital (60.6%); and (6) availability of personal transportation (56.4%). When these same items were cross-tabulated with “If you thought you were having a heart attack and had a car available, would you call 9-1-1 or drive yourself to the hospital,” for each of the six factors, over 85% of respondents are calling 9-1-1. These six factors did not produced significant findings at p-value = .05 in the cross-tabulation. Gibson GC, Bentley MA, Pirrallo R (2011). What Does the Public Think about Safety in Providing Field EMS? Oral Presentation at the annual meeting of the National Association of Emergency Medical Service Physicians. This study examines the public’s perception of providing EMS services in three hazardous situations, and asks about an EMS professional’s likelihood of sustaining a career-ending injury. On providing emergency care when there are risks, for the risk of being shot, 25.0% = yes, 46.1% = no, 29.0% = don’t know); for the risk of being assaulted, respondents answered: 28.3% = yes, 47.2% = no, 24.5% = don’t know; and for risk of drowning, respondents answered: 30.0% = yes, 43.6% = no, 26.5%= don’t know. As for a career-ending injury, 45.7% think a police officer is likely to sustain a career-ending injury, 44.8% think a firefighter, and 9.5% think an EMS professional. Gibson GC, Bentley MA (2011). Training Officers as Educators: The Pedagogical Truth. Poster presentation at the annual symposium of the National Association of EMS Educators. This study sought to learn the pedagogy of training officer, particularly, utilization of educational resources available and the self-reported importance they associate with specific topics. Scale from 1 (hardly used) to 5 (used very often), highest usage was reported for national certification requirements mean = 3.86, SD = 1.4), CE course materials (mean = 3.86, SD = 1.4), and refresher plans (mean 3.36, SD = 1.5). Scaled from 1 (very unimportant) to 10 (very important), system-related topics, e.g., errors in patient care (mean 8.5, SD = 0.2) and new protocols (mean 8.4, SD = 2.3) received the highest importance for what to train in their respective systems. This study lends support to the argument that decisions for what to teach in an EMS system are driven by national requirements and system medical direction. Gibson GC, Bentley MA (2011). Roles and Responsibilities of Training Officers: Allied Educators. Poster presentation at the annual symposium of the National Association of EMS Educators. The objectives of this study were to determine how much time training officers engage in tasks other than developing, planning, and delivering continuing education, and to identify if participation in these tasks vary significantly by service type. Delivery of direct patient care scored highest (mean = 14.9 hours, median = 8 hours, and SD = 18.2 hours), while developing, planning, and delivery of continuing education was third (mean = 8.3 hours, median = 8 hours, and SD = 10.0 hours). Time spent in run reviews, disciplinary action, new employee orientation, and ride alongs varied significantly by service type, with private training officers engaged in these activities for the greatest number of hours in a typical week. Gibson GC, Bentley MA (2011). Public Perceptions of EMS Provider Education: Are We All the Same? Poster presentation at the annual symposium of the National Association of EMS Educators. The objectives of this study were to determine what the general public knows about the education and training of EMS professionals, and to determine if respondents’ age produced significant effects. Findings indicate that the public has no concrete idea how much EMS education and training a paramedic has (Mean = 261.1, SD = 341.7). Additionally, the public thinks EMTS should have some college and paramedics should have Associates degrees. The public placed a high level of importance on educational requirements for license renewal and on graduation from a nationally accredited training program. Respondent’s age did produce significant correlations: the amount of education for EMTs and paramedics drops with respondents’ increasing age, while educational requirements for license renewal, and graduation from a nationally accredited program increases with respondents’ age. In sum, EMS can do a much better job of educating and informing the public about the training of paramedics. Bentley MA, Crawford JM, Wilkins, JR, Gibson GC, Fernandez AR (2011). Depression Among Nationally Certified Emergency Medical Service Professionals: A Descriptive Study. Poster presentation at the annual meeting of the Society of Academic Emergency Medicine. Bentley MA, Fernandez AR, Gibson GC (2011). 12-Lead ECG Obtainment and Interpretation Among Nationally Certified Paramedics. Poster presentation at the annual meeting of the Journal of Emergency Medical Services. The objectives of this study were to quantify how often nationally certified paramedics obtain and interpret 12-lead ECGs and identify work-life characteristics associated with obtaining and interpreting 12-lead ECGs. While 5.2% of nationally certified paramedics reported never obtaining a 12-lead ECG, the majority of paramedics reported obtaining a 12-lead ECG more than once per week to once per month (83.1%). Similarly, 6.8% reported never interpreting a 12-lead ECG while 81.9% interpreted a 12-lead more than once per week and to once per month. None of the work-life variables assessed were significantly associated with obtaining or interpreting 12-lead ECGs. Bentley MA, Fernandez AR, Gibson GC (2011). Utilization of Capnography Among Nationally Certified Paramedics. Poster presentation at the annual meeting of the Journal of Emergency Medical Services. The objective of this study was to quantify utilization of capnography among nationally certified EMS professionals and to determine significant associations between demographic/work-life characteristics and capnography utilization. Of those 601 (80.9%) who performed ETI, 14.1% reported never utilizing capnography. None of the demographic variables assessed revealed statistically significant associations with the utilization of capnography. Frequency of intubation was the only work-life characteristic variable assessed which revealed a significant association with the report of utilization of capnography. Specifically, there was a stepwise increase in the frequency of ETI and the percentage of paramedics reporting using capnography (≤once per year: 69.7%, between once per year and once per month: 85.1%, ≥once per month: 95.5%; p	<0.001). Fernandez AR, Studnek JR, Margolis GS, Crawford JM, Bentley MA, Marcozzi D (2011). Disaster Preparedness Among Nationally Certified Emergency Medical Services Professionals. Poster presentation at the annual meeting of the National Association of Emergency Medical Services Physicians. The objectives of this study were to quantify EMS professional’s individual-level preparedness training (ILPT) in terrorism and disaster preparedness, and participation in multi-agency disaster drills (MDD) and to determine whether ILPT training was correlated with the perception of preparedness (PoP). A complete case analysis was performed (n=21,438). Overall, 19,551 (91.2%) individuals received ≥1 hour of ILPT and 12,828 (59.8%) individuals reported participating in MDD, in the last 24 months. However, 40.9% (8,769) reported <1 hour of ilpt in the treatment and management of patients involved in structural collapse. spearman rank correlation coefficients revealed that for each topic, more hours of ilpt were significantly correlated with increased pop (for each topic area spearman’s rho> 0.40, p-values < 0.001). Fernandez AR, Crawford JM, Pennell ML, Buckley TJ, Wilkins JR, Bentley MA, Studnek JR (2011). Emergency Medical Services Work-Life Characteristics Contribute to Clinically Significant Excessive Daytime Sleepiness. Poster presentation at the annual meeting of the National Association of Emergency Medical Services Physicians. The objectives of this study were to quantify clinically significant excessive daytime sleepiness (CSEDS) in the EMS workforce and identify EMS work–life characteristics and demographics associated with CSEDS. The ESS was completed by 1,047 individuals, and 38% (n = 397) were classified as having CSEDS. Simple logistic regression revealed that the following characteristics were associated with an increased odds of CSEDS: working shifts ≥24 hours, responding to ≥10 calls/week, working >60 hours/week, working rotating shifts, working mandatory or voluntary overtime, leaving EMS, being separated/widowed/divorced, obesity, and having fair/poor overall health. Individuals satisfied with their EMS assignment had decreased odds of CSEDS. Following model selection, working ≥24-hour shifts (OR = 1.79; 95% confidence interval [95% CI] = 1.20–2.65), mandatory overtime (OR = 1.55; 95% CI = 1.07–2.24), voluntary overtime (OR = 1.43; 95% CI = 1.00–2.05), leaving the EMS workforce (OR = 2.52; 95% CI = 1.49–4.26), being separated/widowed/divorced (OR = 1.79; 95% CI = 1.01–3.18), and reporting fair/poor health (OR = 3.62; 95% CI = 1.97–6.67) remained significantly associated with CSEDS. Bentley MA, Fernandez AR, Brown WE, Margolis GS (2009). Relationship of Education Program Size to First Attempt Pass Rate on the National Paramedic Certification Examination. Oral Presentation at the National Association of Emergency Medical Services Educators. The objectives of this study were to determine the number of active paramedic programs in the US and to describe the relationship of number of candidates per year and first attempt pass rate. 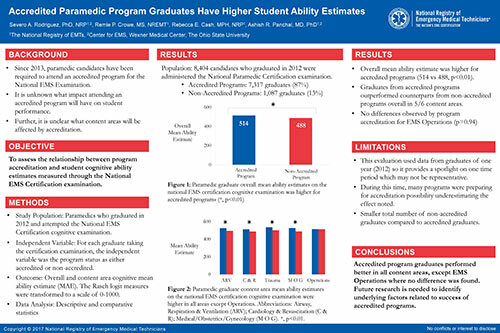 It was hypothesized that large programs would have significantly higher pass rate on the NREMT exam than small and medium programs. To meet the objectives, the NREMT database was queried. Paramedic programs were categorized by small (1-10 students), medium (11-19), and large (≥20). Large paramedic education programs have a higher pass rate than both small and medium sized programs. Over a third of paramedic programs in the NREMT database were inactive (graduated no students during the study period). Bentley MA, Studnek JR, Fernandez AR (2009). Characteristics Associated with Latex Sensitivity among Nationally Certified EMS Professionals. Oral presentation at the annual meeting of the Journal of Emergency Medical Services (awarded Best Research). The objectives of this study were to determine individual and work-life characteristics associated with latex sensitivity among EMS professionals. Latex sensitivity was defined as the reported by 15.2 % of EMS professionals. More females reported having a latex sensitivity (21.5% vs. 12.8%, p=0.001). As the reported number of calls per week increased, there was an increase in the frequency of latex sensitivity (0-1=4.0%, 2-29=15.7%, ≥30=20.5%; p=0.001). Those working for a county or municipal service reported the lowest frequency of latex sensitivity, while those who worked for a private service had the highest (county/municipal=11.9%, fire=12.7%, other=14.1%, private=22.4%; p=0.010). More paramedics (17.6%) reported a latex sensitivity than basics (10.8%) or intermediates (10.0%, p=0.025). Fernandez AR, Studnek J (2009). The Relationship between EMT-Basic Exam Score and Success on the National Paramedic Certification Exam. Poster presentation at the 2009 annual meeting of the National Association of EMS Physicians (awarded Best Poster Presentation). This study analyzed the relationship between EMT-Basic NREMT exam score and success on the national paramedic certification exam. An individual’s score on the national EMT-Basic certification exam was significantly associated with success on the national paramedic certification exam. Individuals who received =80% on their EMT-Basic exam were five times more likely to pass the paramedic exam on the first attempt than those who scored =71%. Margolis GS, Romero GA, Fernandez AR, Studnek J (2009). Strategies of High-Performing Paramedic Education Programs. Poster presentation at the 2009 annual meeting of the National Association of EMS Physicians. Twelve EMS educational programs that achieved consistently high performance on the national paramedic certification exam participated in a focus group to identify the strategies leading to a successful paramedic educational program. A nominal group technique yielded the following twelve suggestions: 1) Achieve and maintain national accreditation; 2) Maintain high level entry requirements and prerequisites; 3) Provide students with a clear idea of expectations for student success; 4) Establish a philosophy and foster a culture that values continuous review and improvement; 5) Create your own exams, lesson plans, presentations, and course materials using multiple current references; 6) Emphasize EMT-Basic concepts throughout the class; 7) Use frequent case based classroom scenarios; 8) Expose students to as many prehospital ALS patient contacts as possible, preferably where they are in charge; 9) Create and administer valid exams that have been through a review process (such as qualitative analysis); 10) Provide students with frequent detailed feedback regarding their performance (such as formal exam reviews); 11) Incorporate critical thinking and problem solving into all testing; and 12) Deploy predictive testing with analysis prior to certification. Studnek J, Crawford JM, Fernandez AR (2009). Evaluation of Occupational Injuries in an Urban Emergency Medical Services System Before and After Implementation of Mechanical Stretchers. Poster presentation at the 2009 annual meeting of the National Association of EMS Physicians. This study evaluated occupational injuries in an urban EMS system (Austin Travis County EMS) before and after implementation of mechanical stretchers. This agency experience a dramatic drop in the incidence of work related injuries and lost workdays. While the mechanical stretcher may not be only reason for the decreases, it is presumed to be a significant factor. Studnek J, Fernandez AR, Margolis GS (2009). Assessing Competency among Low Frequency EMS Providers. Poster presentation at the 2009 annual meeting of the National Association of EMS Physicians. The primary objective of this study was to assess the continued competence of EMT-Basics practicing in low frequency environments. Participants from two rural and contiguous states were administered a validated general knowledge EMT exam. The amount of continuing education and call volume were not significantly associated with passing the examination. Fernandez AR, Studnek JR, Cone D (2008). The Relationship between EMT-Basic Experience and Success on the National Paramedic Certification Examination. Poster presentation at the annual meeting of the Society for Academic Emergency Medicine. June 2008. This study assessed the association between EMT experience and performance on the National Registry of EMT’s (NREMT) Paramedic exam. First attempt paramedic scores from 2002-2006 in the 14 states that utilize NREMT tests for initial certification of both EMT-Bs and Paramedics were analyzed. The time period between passing the NREMT EMT-B exam and the first attempt of the paramedic exam was used as a surrogate indicator of EMT experience. EMT-Bs with 2.5-10 years experience were most likely to pass their first paramedic exam attempt. Fernandez AR, Studnek JR (2008). Smoking and Cessation Patterns among Nationally Registered Emergency Medical Services Professionals. Poster presentation at 2008 annual meeting of the National Association of EMS Physicians. By surveying over 30,000 EMS personnel re-registering in 2007 it was determined that 35.5% EMS professionals have smoked tobacco. Of those, about half no longer smoke. Of the remaining, 98.0% attempted to quit within the last 12 months. A higher percentage of females in EMS reported being current smokers (female 25.5% vs. male 19.7%, p <0.001) with a prevalence notably higher than that found in the general population. Fernandez AR, Studnek JR (2008). Body Mass Index of Emergency Medical Services Professionals. Poster presentation at 2008 annual meeting of the National Association of EMS Physicians. EMS personnel re-registering in 2007 were asked to voluntarily provide their current height and weight and body mass index (BMI) was calculated. The mean BMI for study participants was 27.74 (95% CI 27.68-27.81), and 71.5% were classified as having high (=25) BMI. More males reported having a high BMI compared to females (79.2% vs 50.8% p <0.001). a step wise increase in the percentage of those reporting high bmi was present when comparing provider’s certification level (emt-basic 68.0%, emt-intermediate 73.4%, and paramedic 77.0% x2=185.2, p < 0.001). those working for a military service reported the lowest prevalence of high bmi (61.7%), while those who worked for a fire based service had the highest (77.7%). Studnek JR, Fernandez AR (2008). Do Emergency Medical Services Professionals Meet CDC Physical Activity Recommendations? Poster presentation at the 2008 annual meeting of the National Association of EMS Physicians. The Centers for Disease Control recommends that individuals participate in moderate-intensity physical activity for 30 minutes a day, 5 or more days a week. This study was conducted to determine what proportion of EMS professionals meets this guideline. EMS professionals re-registering in 2007 were asked to complete a survey and 24.3% met the CDC recommendations. Males were more likely to report meeting CDC recommendations (25.4% vs. 21.4% p <0.001). a step wise decrease in the percentage of those meeting cdc recommendations was present when comparing provider’s certification level (emt-basic 28.5%, emt-intermediate 21.5%, and paramedic 18.0% x2=283.5, p < 0.001). This project quantified the amount of contact nationally registered EMS professionals have with their medical director. Participants indicated how often they interacted with their medical director in three specific situations (participation in continuing education, met personally to discuss an EMS issue, and saw medical director at the scene of an EMS call). Overall, 62.5% individuals reported having contact with the medical director in one of the above situations within the last 6 months. MD contact increased with certification level and varied by service type. EMS professionals working in urban areas were more likely to report recent MD contact than those in rural areas. Lerner B, Shah MN, Fernandez AR (2008). Do EMS Providers Think They Should Participate in Disease Prevention? Poster presentation at 2008 annual meeting of the National Association of EMS Physicians. The objective of this study is to determine EMS providers’ opinions regarding participation in disease prevention initiatives. Eighty-one percent (95% CI: 80.5 -81.6) of EMS providers re-registering in 2006 believed that they should participate in disease prevention programs and 28.8% (95% CI: 28.2-29.5) of respondents reported actually having provided prevention services. Those who had a graduate degree were the most likely to have provided prevention services (40%, p<0.001), as were those who had worked in ems for more than 21 years (41%, p <0.001). This study combined a number of student and program characteristics to develop a multivariable model to estimate the probabilities for success for individuals entering into paramedic training programs. The parameters, in descending order of statistical significance, included; institutional accreditation, student’s high school class rank, student’s highest level of education, instructor credentials, student’s gender, and race. Variables not significantly associated with student success included; academic setting, course completion as an employment requirement, and student age. Using 2005 testing data, it was determined that there is an association between a candidate’s score on national EMS certification examinations and the amount of time that has elapsed since completion of an EMS course. There is a statistically significant decrease in score of 0.009% for EMT-Basics and 0.011% for Paramedics for every day delay in taking the testing. While this association is statistically significant, it takes a considerable period of time for it to practically affect an individual score. Margolis GS, Fernandez AR, Studnek JR (2007). Intent to Leave the EMS Profession. Poster presentation at the annual Meeting of the Journal of Emergency Medical Services. This study quantified the percentage of EMS personnel, by system type and level of certification, that intend to leave the EMS profession in the next year. A stratified representative sample of 1,945 Nationally Registered EMS personnel rated the likelihood that they would leave the EMS profession in the next 12 months on a 4 point Likert scale (definitely stay, probably stay, probably leave, definitely leave). Weighted data suggest that 5.65% answered that they will probably or definitely leave the EMS profession in the next 12 months. Subgroup analyses indicated that fire based EMS workers were significantly less likely to report that they would leave the profession in the next 12 months and 2-4 times higher in private-for profit and “other” agencies. Margolis GS, Studnek JR, Fernandez AR, (2007). A Categorical Schema of EMS Personnel. Poster presentation at the annual Meeting of the Journal of Emergency Medical Services. This descriptive project developed a conceptual framework in which the diversity of the EMS workforce can be considered and quantifies the size of each category. A representative sample of 1950 Nationally Registered EMS personnel were categorized according to three dimensions: Certification level (EMT-Basic and Paramedic), EMS Service Type (Fire Based, 3rd Service, Private-for profit, Other), Remuneration category (Career, Compensated Volunteer (volunteers reporting = $1000/year of EMS related income), and Uncompensated Volunteer (volunteers reporting less than $1000 year of EMS related income). The percentage of uncompensated volunteer paramedics is very low and over half of the EMT-Basics are ‘career.’ While more EMS personnel are affiliated with fire departments than any other system-type, the majority of EMS personnel do not work in fire based systems. Studnek JR, Fernandez AR, Margolis GS (2007). Emergency Preparedness of Nationally Registered First Responders. Poster presentation at the annual Meeting of the Journal of Emergency Medical Services. This study estimates the number of NRFRs who have received training in the management and treatment of patients involved in biological, chemical, nuclear, explosive emergencies and structural collapse. Of the 1957 NRFRs that re-registered in 2006, surveys were received from 1212 (62%). In the last 24 months 60.8% of NRFRs indicated that they had received training in the recognition of BCN hazards while 53.4% have received training on the treatment of patients and 28.0% have participated in multi agency drills in those situations. Training in the treatment of patients involved in explosions or structural collapse was received by 40.0% and 39.0% of NRFRs, respectively. Participation in multi-agency drills involving explosions or structural collapse was reported by 24.9% of NRFRs. In the last 24 months 38.1% of NRFRs have received less than one hour of preparedness training, 40.8% received 1-8 hours and 21.0% have received 9 or more hours. Finally, there were statistically significant differences between rural and urban NRFRs with regards to BCN hazards in the recognition, patient treatment and participation in multi agency drills. Fernandez AR, Studnek JR (2007). Organizational Description & Community Size of Nationally Registered First Responders. Poster presentation at the annual Meeting of the Journal of Emergency Medical Services. Studnek JR, White L (2007). Effect of Sleep Disorders on Emergency Medical Technicians. Poster presentation at the annual Meeting of the Journal of Emergency Medical Services. Using the Longitudinal EMT Attributes and Demographics Study (LEADS) this project intends to describe the effect of self- reported sleep problems on EMTs. In 2004 and 2005 there were 1775/5565 (31.9%) and 1857/6011 (30.9%) respondents respectively. Sleeping problems were identified by 30.6% of EMTs in 2004 and 24.0% in 2005. Of those EMTs reporting sleeping problems in 2004 significantly more had been involved in an ambulance crash in the past 12 months 8.6% compared to 4.7% (p=0.031). In 2005 21.8% of EMTs reporting sleeping problems and missed one or more days of work compared to 9.0% of those with no sleeping problems (p	< 0.0001). other characteristics such as satisfaction and overall health were also significantly associated with sleeping problems. Studnek JR, Fernandez AR (2007). Utilization of Distributive Education to Fulfill National Registry Re-Registration Requirements. Poster presentation at the annual meeting of the National Association of EMS Physicians. This project was conducted to determine what proportion of nationally registered EMTs and Paramedics report using DE to fulfill their section two re-registration requirements. A sample of 1-2% of all non-military EMT-Basics and Paramedics re-registering in 2004 and 2006 were reviewed. Data was collected from 348 applications from 2004 and 649 from 2006. DE was utilized by 19.3% (67/348) of applicants in 2004 and 20.5% (133/649) in 2006. In both years EMT-Basics were significantly more likely than Paramedics to report using DE (26.4% vs. 12.1%, p<= 0.001 and 23.4% vs. 16.8%, p<= 0.038 respectively). While DE can account for 50% of yearly section two CE, among those who used DE in 2004 and 2006, on average only 20.4% and 27.4% of CE was accounted for through DE. Studnek JR, Margolis GS, Mistovich JJ, Fernandez AR (2007). Identifying Educational Strategies of Successful EMT-Basic Programs. Poster presentation at the annual meeting of the National Association of EMS Physicians. This project develops a list of specific educational strategies used by those who attain consistent success. A seven-step nominal group technique (NGT) was used to determine if strategies that lead to a successful EMT-Basic educational program could be identified. Ten out of the twelve EMS educational programs meeting the eligibility requirements participated. After completing the seven step NGT process, 12 strategies were identified as leading to a successful EMT-Basic educational program; accept students who are highly motivated to succeed, assure institutional support, administer multiple assessments, develop standardized lesson plans, have a passing standard that is above the minimum competency level, hire qualified/certified instructors, maintain effective communication between didactic, practical and field instructors, maintain instructional consistency, provide clearly defined objectives, provide immediate feedback for written and practical evaluations to students, require prerequisites, teach test taking skills. Brown WE, Studnek J, Levine R (2006). Relationship Between Shift Work and Work Life of Emergency Medical Technicians: A Preliminary Analysis. Poster presentation at the 134th Annual Meeting of the American Public Health Association (APHA). A prospective study of Emergency Medical Technicians (EMT) was conducted to determine if relationships exist between shift work and the job performance, family life, personal health and safety of EMTs. EMTs indicating that they work 24-hour shifts had significantly higher ESS scores than those not working 24-hour shifts (p=.03). EMTs working 24 hour shifts were more likely to report having difficulty driving emergency vehicles long distances (12.4% vs. 6.2%, p=.007) and to report having difficulty remembering treatment protocols because they were sleepy or tired (13.3% vs. 7.1%, p=0.006). Nearly one-quarter (23.3%) of the EMTs working 24-hour shifts reported that being sleepy affected their relationship with family, friends or work colleagues compared to 17.2% of those not working 24 hours (p=0.04). Fernandez AR, Studnek JR (2007). Quantifying and Describing Actively Practicing Nationally Registered EMT-Basics. Poster presentation at the annual meeting of the National Association of EMS Physicians. Fernandez AR, Studnek J (2006). Quantifying the Educational Background of EMS Educators. Poster at the annual symposium of the National Association of EMS Educators. As part of the biennial re-registration paperwork, Nationally Registered EMS professionals were asked to complete a survey reporting their highest level of education and their primary role in EMS. Those individuals who reported their primary role in EMS was that of an EMS educator reported the following was their highest level of education. 11.6% High School/GED, 38.5% Some College, 20.9% Associate Degree, 21.3% Bachelor’s Degree, 7.8% Graduate Degree. Overall, EMS instructors have similar educational credentials to the students that they are teaching. Studnek JR, Porter K (2006). The Relationship between Ambulance Crashes and Emergency Medical Technician Age. Poster presentation at the annual meeting of the Society for Academic Emergency Medicine. Ambulance crashes can have devastating effects on the community. This study intends to determine what EMTs have an increased chance of involvement in an ambulance crash. In 2004 a cohort of nationally registered EMTs and Paramedics were asked to report if they had been involved in an ambulance crash. Variables significantly associated with accidents in the past year were call volume (p <0.0001), ambulance time (p=0.0008), and age (p=0.0004). controlling for call volume and ambulance time, the odds of having had a crash within the past year were significantly higher the younger the emt. when controlling for call volume and ambulance time, the odds of having been in an ambulance accident within the past year was significantly higher for younger emts. Margolis GS, Studnek JS (2006). How Many Volunteer EMTs Are There, Really? Poster presentation at the annual Meeting of the Journal of Emergency Medical Services. This study was survey of randomly selected and stratified nationally registered EMT-Basics and Paramedics. Half of the EMT-Basics report being a volunteer and one-third were uncompensated (report less than $1000/year of EMS related income). Approximately 20% of paramedics report being a volunteer; however the percent of uncompensated volunteers was only 2.6%. Many volunteer EMTs and paramedics have significant EMS related income. Compensated EMT-Basic volunteers report an average of $10,239 of EMS related income, and Paramedic report an average of $32,772. Studnek J, Porter K (2006). Are Paramedics Practicing as Traditional EMS Providers? Poster presentation at the annual Meeting of the Journal of Emergency Medical Services. This study was conducted to quantify the number of Nationally Registered Paramedics working as traditionally practicing EMS providers. A random sample of Nationally Registered Paramedics completed a questionnaire to determine the number of “traditionally practicing” Paramedics. A traditionally practicing Paramedic was defined as a respondent who, performs EMS work for at least one EMS organization, works for an EMS organization that utilizes their Advanced Life Support skills, and in a typical week responds to ³ 6 EMS calls, initiates ³ 2 prehospital IVs, completes ³ 3 patient care report forms and responds to ³ 3 911 calls. There were 183 (70.4%) paramedics classified as “traditionally practicing”. There appears to be a large proportion of Nationally Registered Paramedics not filling the role of the traditionally practicing Paramedic. This may contribute to the perception that there is a shortage of Paramedics. Simply increasing the number of certified Paramedics is unlikely to resolve the perception of a Paramedic work force shortage. Margolis GS, Levine RL, Wijetunge G (2006). The Change in Full-Time EMS Provider Career Satisfaction in their First Three Years of Employment. Oral presentation at the annual meeting of the National Association of EMS Physicians. The longitudinal study compared full-time EMS workers level of career satisfaction in the initial year of certification to their satisfaction two years later. EMT-Basics career satisfaction did not change; however, there was a significant decrease in career satisfaction among Paramedics. The decrease in career satisfaction appeared to be more dramatic in rural settings. Studnek J, Crawford JM (2006). Predictors of Back Problems among Emergency Medical Technicians. Poster presentation at the annual meeting of the National Association of EMS Physicians. Using a cohort of nationally registered Emergency Medical Technicians (EMTs) this project intends to describe possible predictors of back problems among EMTs. A case-control analysis was performed; wherein cases were 104 subjects reporting new back problems in 2004. Controls were 475 subjects reporting no back problems in 2003 and 2004. Paramedics were significantly more likely to report back problems compared to EMT-Basics (OR = 1.72; 95% Confidence Interval (CI) = 1.004-2.93), as were those EMTs dissatisfied with their current EMS assignment (OR = 9.33; 95% CI = 3.04-28.67) and EMTs reporting good (as compared to excellent) fitness (OR = 3.39; 95% CI = 1.54-7.45). Results from this analysis, one of few analytic studies in this field, suggest several factors that could contribute to self-reported back problems among EMTs, including job dissatisfaction and physical fitness. Studnek J, Margolis GS (2005). Educational Background Correlates to Success on the National Registry of EMTs Written Certification Examination. Poster presentation at the annual symposium of the National Association of EMS Educators. Self-reported years of education were compared to the pass rates of EMT-Basic students on the written portion of the certification examination using Chi-squared analysis. First time pass rate was significantly associated with education level. Pass rates significantly increase as education level increases. The educational background of EMT-Basic students is highly correlated to first time pass rate on the written portion of the national certification examination. EMS training institutions attempting to improve pass rates on the EMT-Basic national certification examination should investigate their student’s educational background. Studnek JR, Margolis GS, Levine R (2005). Relationship Between Organizational Policy and EMT Seat Belt Use. Poster Presentation at the annual meeting of the Society of Academic Emergency Medicine. The objective of this study was to determine the relationship between organizational policy and seat belt use among EMTS. With the 2003 recertification paperwork, EMS professionals were asked to complete a survey on the safety and health risks facing EMS providers. A statistically significant relationship was found between seat belt use and whether or not an EMT worked for an organization that has a written seat belt use policy. EMS organizations with front seat seat belt use policies have a higher number of employees reporting “high” seat belt use than those organizations that do not have seat belt use policies. Margolis GS, Studnek J, Brazelton TB (2005). The Relationship of a State's Paramedic Program Accreditation Policy to First-Time Pass Rate on the National Paramedic Certification Written Exam. Poster presentation at the annual symposium of the National Association of EMS Educators. This study compared the performance of candidates taking the National Registry Paramedic exam from states that mandate paramedic program accreditation to those states that do not. The study concluded that states that mandating national paramedic program accreditation have a significantly higher first time pass rate than those not requiring national accreditation. Interestingly, the difference in performance increased throughout the study period. Studnek J, Margolis GS, Levine R (2005) EMT and Paramedic Rating of the Perceived Effectiveness of EMS Workforce Retention Strategies. Oral presentation at the annual Meeting of the Journal of Emergency Medical Services. EMTs and Paramedics will identify some retention strategies as more effective than others. Nationally Registered EMTs re-registering in 2004 were asked to complete a survey requesting them to rate the effectiveness of ten strategies for retaining new individuals in EMS. While there were statistically significant differences between EMTs and Paramedics for all strategies and statistically significant differences between paid and volunteer providers for most strategies, effect sizes never exceeded .42, suggesting the differences were of small practical significance. Currently registered and practicing EMTs and Paramedics perceived increasing pay and benefits, opportunities for advancement, and increased appreciation of the work EMTs do as the most effective retention strategies. Margolis GS, Dickison PD (2005). The Relationship Between Paramedic Instructor Qualifications and Student Performance on the National Certification Written Exam. Poster presentation at the annual meeting of the National Association of EMS Physicians. Candidates taking the National Registry of EMTs Paramedic exam were asked to identify the clinical credential and highest educational degree attained by their lead instructor which was correlated to the first time pass rate. Students who’s instructor was a nurse performed better than all other instructors (72.9% vs. 55.2%) and a linear relationship exists as the educational degree increases (from 62.7% at the Associates Degree level to 78.5% at the Doctoral level). O’Keefe M, Levine R (2004). Terrorism Response Training for Emergency Medical Technicians Since September 11, 2001: A Nation Unprepared. Poster presentation at the Annual Meeting of the American College of Emergency Physicians. The goal of this study was to assess the amount and type of terrorism-related training provided to emergency medical technicians (EMTs) in the two years following September 11, 2001. The median number of hours of such training was less than one hour for EMT-Bs and between one and four hours for EMT-Ps. Less than one hour of training for responding to terrorism was received by 51% of all EMTs. Length of training was also associated with community size, with 41% of urban EMTs reporting less than one hour, compared to 57% of rural EMTs. The majority of EMS providers received less than one hour of training related to terrorism response. Margolis GS, Wagoner RL (2004). The Relationship Between High School Class Rank and Performance on the Paramedic National Certification Exam. Oral presentation at the annual symposium of the National Association of EMS Educators. This project compared the self reported high school class rank of candidates on the NREMT paramedic exam with their first time pass rate. Students who graduated in the lower third of their high school class had 53.0% first time pass rate, with graduates in the top 10% having a 79.3% pass rate. About half of the candidates reported graduating the upper 30% of their high school class, with only 5.5% graduating in the lower 30%. The study concluded that there is a strong relationship between a candidate’s self reported high school class rank, and the first time pass rate on the written portion of the national certification exam. As part of the biennial re-registration paperwork, Nationally Registered EMTs were asked to complete a survey ranking their satisfaction in nine aspects (working relationships with other EMTs, pay/benefits, job excitement, technical challenges, variety of tasks/situations, work schedule, advancement opportunities, autonomy, and being able to help others) of their work life. Over 24,000 individuals responded. Reregistering EMTs and Paramedics appeared to be largely satisfied with most major aspects of their EMS position. For both EMTs and Paramedics, the major sources of dissatisfaction appear to be pay/benefits, opportunities for advancement, and work schedule. The research question investigated was: do female Emergency Medical Services (EMS) professionals exert less emotional labor (less surface acting and deep acting) than male EMS professionals, and do females report higher job satisfaction? Surface acting involves displaying emotions that are not felt, for example an EMS professional who “puts on” a sympathetic face for a patient’s problem but s/he is actually irritated. Deep acting focuses on modifying inner feelings, where one attempts to “actually feel” the emotions one wishes to display, such as compassion for a patient’s problem. A large sample of 24, 586 (33.9% response rate) nationally certified EMS professionals filled out a short paper and pencil survey in the Fall, 2011 to test the research question. The results showed that while female EMS professionals had statistically significant lower surface acting and deep acting, and higher job satisfaction than EMS males, the mean differences in scale scores were practically or clinically trivial. However the results also showed that for all EMS respondents, as surface acting increased, job satisfaction decreased. Very small, non-meaningful differences in female versus male surface acting, deep acting and job satisfaction were found. However, surface acting had a substantial negative relationship to job satisfaction while deep acting did not. Out-of-hospital care is becoming more complex, thus placing greater reliance on the cognitive abilities of paramedics to manage difficult situations. In adapting to the challenges in their work, paramedics develop expertise. We conducted a "staged-world" cognitive task analysis to explore paramedics' handling of cognitive challenges related to sense-making and to resource and task management. A mixed-fidelity simulation was used to present paramedics with 2 challenging scenarios: a pulmonary embolism initially presenting as a myocardial infarction and a 2-person shooting with limited resources available. Participants were 10 paramedics, 6 more experienced and 4 less experienced. Analysis involved comparing the performance of the 2 groups to identify strategies associated with expertise. The more experienced paramedics made more assessments, explored a wider variety of presumptive diagnoses, and identified the pulmonary embolism earlier. They switched attention between the 2 shooting victims more, used their emergency medical technician-basic level partners more, and provided more advanced level care for both patients. Their patients arrived at the emergency department more prepared for specialized emergency care. Our findings correspond to general cognitive attributes of expertise: greater cue gathering and inferential reasoning, and more functional and strategic thinking. These results suggest potential areas and methods to facilitate development of expertise, as well as ways to better support use of expertise. The primary objective of this study was to estimate the prevalence and severity of depression, anxiety, and stress among a cohort of nationally certified emergency medical services (EMS) professionals. This was a questionnaire-based, case-control analysis of nationally certified emergency medical technician (EMT)-Basics and paramedics who applied for national recertification in 2009. The three outcome variables of interest included measures of depression, anxiety, and stress, and were assessed using the Depression Anxiety Stress Scale-21 (DASS-21). Descriptive statistics and investigator-controlled backwards-selection logistic regression modeling were utilized to quantify the prevalence of depression, anxiety, and stress and to predict the association of demographic and work-life characteristics with each outcome. A total of 64,032 individuals were eligible to renew their national certification and 34,340 (53.6%) individuals returned a questionnaire. The DASS-21 classified 1,589 (6.8%, 95% confidence interval [CI] = 6.4%-7.1%) EMS professionals as depressed, 1,406 (6.0%, 95% CI = 5.7%-6.3%) as anxious, and 1,382 (5.9%, 95% CI = 5.6%-6.2%) as stressed. Multivariable logistic regression estimates showed that paramedics, those working in county or municipal services or private services, and those with =16 years of EMS experience had an increased odds of depression. A stepwise increase was found when estimating the effects of self-reported general health on the odds of anxiety, those working in a private EMS system, and those with =16 years of EMS experience had an increased odds of stress. Specific objectives of our study were to describe demographic and work-life characteristics of training officers, estimate the number of hours spent on specific training officer tasks in a typical week, and determine methods of training officer appointment and education received after appointment. This was a questionnaire-based cross-sectional census analysis of all training officers in the National Registry of Emergency Medical Technicians (NREMT) database. This questionnaire contained items related to demographics, work-life characteristics, and specific roles and responsibilities of training officers. Descriptive statistics, chi-square, and Mann-Whitney U tests were utilized to assess specific differences among training officers. Over 2,500 individuals responded to this questionnaire (2,528/4,956). The majority of the respondents were male (79.0%), held a full-time salaried position (64.9%), and were of nonminority status (93.4%). Individuals reported an overall median number of years worked in EMS of 19.0 (standard deviation [SD] = 8.7, range = 0-45) and a median of 4.0 years of serving as a training officer (SD = 5.1, range = 0-33), and planned to serve as a training officer for a median of 10.0 years (SD = 7.6, range = 0-50). The highest median numbers of hours spent on specific training officer tasks in a typical week were for providing patient care (median = 8.0, SD = 18.1); developing, delivering, and accounting for continuing education (median = 5.0, SD = 9.8); department administration (median = 5.0, SD = 12.8); and performing run reviews (median = 3.0, SD = 6.4). The role of the training officer in ensuring the continued competence of the EMS professional has not been delineated in this paper, and future efforts should seek to answer this research question. This paper's aim is to study a neglected relationship: testing the impact of emotional labor on the work exhaustion for samples of emergency medical service (EMS) professionals. Three distinct samples of EMS professionals were surveyed to test the impact of three variable sets, personal (e.g. gender, age, health), work-related (e.g. years of service, job satisfaction), and emotional labor (i.e. surface acting, deep acting) on work exhaustion. Results across the three samples consistently showed that surface acting had a significantly stronger positive impact than deep acting on work exhaustion. In addition it was found that surface acting had a significantly stronger negative relationship to job satisfaction than deep acting. Surface acting also had a significant negative relationship to perceived health. Years of service were positively related to work exhaustion across all samples, while job satisfaction was negatively related. Work exhaustion is an occupational risk for EMS professionals. Individuals considering EMS as a career must have realistic expectations and information about the rewards as well as challenges facing them. To help buffer the impact of emotional labor on work exhaustion and related outcomes, EMS stakeholders should consider facilitating mentor and/or peer support group programs to enhance the development of stronger camaraderie in different EMS-based organizations (e.g. hospitals, fire services). This study evaluated the incremental impact of a job-related set of variables for explaining a utility judgment training effectiveness variable, course completion skill preparedness. We found for both samples that the quality of course materials and quality of lead instructor variables each significantly explained course completion skill preparedness variance beyond controlled for background variables. We also found that the set of job related variables explained further, additional variance and that job satisfaction was positively related to course completion skill preparedness for both samples. Studnek JR, Crawford M, and Fernandez, AR. (2012). Evaluation of Occupational Injuries in an Urban Emergency Medical Services System Before and After Implementation of Electrically Powered Stretchers. Applied Ergonomics, 43:198-202. The objective of this study was to evaluate occupational injuries in an urban EMS system before and after implementation of hydraulic stretchers. There were 2087 and 706 person-years of observation pre- and post-intervention, respectively. The incidence rates for overall injury pre-intervention and post-intervention were 61.1 and 28.8 per 100 FTE, with a corresponding RR of 0.47 (95% CI 0.41e0.55) indicating a significant decrease in the rate of injury. The subcategory of stretcher-related injuries had the lowest RR (0.30; 95% CI 0.17e0.52) when comparing pre- and post-intervention time periods. The purpose of our study was to investigate the importance of different items as reasons for leaving the Emergency Medical Service (EMS) profession. Results showed that the desire for better pay and benefits was a more important reason for leaving EMS for the partially compensated versus fully compensated respondents. Perceived lack of advancement opportunity was a more important reason for leaving for the partially compensated and volunteer groups versus the fully compensated group. Blau, G and Gibson, G. (2011). Exploring Antecedents of Intrinsic Versus Extrinsic Satisfaction in a Sample of Emergency Medical Service Professionals. Journal of Workplace Behavioral Health, 26:240-251. This study analyzed the potential of personal, job perceptions, work attitudes, and intent to leave the field of EMS variables on intrinsic and extrinsic job satisfaction measures. Sample consisted of LEADS respondents who had completed annuals surveys in 2006, 2007, and 2008 (n = 292). Sample was found to be demographically representative of the larger survey group of LEADS respondents. Findings indicate that prior intrinsic (extrinsic) satisfaction was the dominant antecedent of subsequent intrinsic (extrinsic) satisfaction. Additionally, continuing education instructor quality as a significant antecedent across both types of subsequent satisfaction. Fernandez, AR, Studnek JR, Margolis GS, Crawford M, Bentley, MA, and Marcozzi M (2011). Disaster-preparedness of Nationally Certified Emergency Medical Services Professionals. Academic Emergency Medicine 18(4): 403-412. This study sought to quantify the amount of individual-level training EMS professionals received in terrorism and disaster-preparedness, and assess EMS professionals’ participation in multiagency disaster drills across the US. Findings indicate that 91.2% of respondents reported receiving at least 1 hour of individual-level preparedness training, and 59.8% reported participating in multiagency disaster drills in the prior 24 months. Perceptions of preparedness and amount of individual-level training were significantly correlated with the perception of preparedness. A majority of nationally certified EMS professionals reported participation in individual-level and multiagency disaster-preparedness training, and reported feeling adequately prepared to respond to disasters. Studnek JR, Fernandez AR, Shimberg B, Garifo M, and Correll M. (2011). The Association between Emergency Medical Services Field Performance Assessed by High-fidelity Simulation and the Cognitive Knowledge of Practicing Paramedics. Academic Emergency Medicine, 18:1177-1185. The objective of this study was to assess the association between the performance of practicing paramedics on a validated cognitive exam and their field performance, assessed on a simulated emergency medical services (EMS) response. This was an observational study of 107 paramedics from a single-tiered, urban, advanced life support EMS agency. Participants reported a median of 7.7 years of service (interquartile range [IQR] = 4.1 to 12.8 years). Ninety-two (86.0%) participants received a passing score for the simulation and 77 (72.0%) passed the cognitive exam. There were 70 (65.4%) individuals who passed both the simulation and the cognitive exam, eight (7.5%) who failed both the simulation and cognitive exam, 22 (20.6%) who passed the simulation but failed the cognitive exam, and seven (6.5%) who failed the simulation but passed the cognitive exam. Results demonstrated an association between a practicing paramedic’s performance on a cognitive examination and field performance, assessed by a simulated EMS response. The purpose of this study was to determine the willingness to respond to the Pandemic Influenza. Of the 586 respondents who met inclusion criteria (currently active EMS providers in primarily EMS response roles), 12% indicated they would not voluntarily report to duty in a pandemic influenza emergency if asked, 7% if required. A majority (52%) indicated their unwillingness to report to work if risk of disease transmission to family existed. Confidence in personal safety at work (OR = 3.3) and a high threat/high efficacy (‘‘concerned and confident’’) EPPM profile (OR = 4.7) distinguished those who were more likely to voluntarily report to duty. Although 96% of EMS workers indicated that they would probably or definitely report to work if they were guaranteed a pandemic influenza vaccine, only 59% had received an influenza immunization in the preceding 12 months. Studnek JR, Crawford M, Wilkins III J.R., and Pennell ML. (2010). Back Problems Among Emergency Medical Services Professionals: The LEADS Health and Wellness Follow-Up Study. American Journal of Industrial Medicine, 53:12-22. This study described work-life and demographic characteristics associated with reporting recent back pain and estimated back pain severity among Emergency Medical Services (EMS) professionals. There were 470/930 (50.5%) participants who reported one or more days of pain in the back or legs over a 2-week period. The variables most strongly associated with recent back pain and pain severity were prior back problems, self-reported health, and job satisfaction. This study indicated that work-life, health, and demographic characteristics of EMS professionals were associated with reporting recent back pain. Studnek JR, Bentley MA, Crawford JM, Fernandez AR. (2010). An Assessment of Key Health Indicators among Emergency Medical Services Professionals. Prehospital Emergency Care. 14(1): 14-20. The primary objectives of this study included quantifying existing health conditions and describing key health indications among EMS professionals. 23.5% of individuals reported at least one existing health condition. The mean BMI for the study participants was 27.69 kg/m2. 28.8% of individuals were classified as having normal weight and 25.8% were obese. The overwhelming majority of individuals did not meet the CDC recommendations for physical activity. This study was the first known baseline assessment of EMS professionals regarding the key health indicators indentified by Healthy People 2010. This study analyzed the relationship between EMT-B NREMT exam score, length of EMT-B certification, and success on the national paramedic certification exam. Both EMT-B NREMT exam score and length of EMT-B certification were significantly associated with success on the first attempt of the national paramedic certification exam. Specifically, the largest difference was seen when comparing scores ≤71% to those ≥ 80% (paramedic exam pass rates of 45.6 and 80.8%, respectively; OR = 5.4, 95% confidence interval [CI] = 4.7 to 6.2). Individuals whose length of EMT-B certification was >1.6 years had increased odds of passing the paramedic examination (OR = 1.2, 95% CI = 1.1 to 1.3). While length of EMT-B certification was statistically significant, the adjusted OR calls into question the practical significance of this variable. Educators may wish to consider these two factors when determining paramedic program admission standards and/or consider these variables when determining how to allocate program resources. Margolis GS, Romero GA, Fernandez AR, Studnek JR (2009). Strategies of High-Performing Paramedic Educational Programs. Prehospital Emergency Care 2009, 13:505-511. A nominal group technique was used to identify the specific strategies used by high-performing Paramedic programs to maintain high first time pass rates. From these, the following twelve recommendations to improve pass rates on the NREMT certification exam were derived: 1) achieve and maintain national accreditation; 2) maintain high-level entry requirements and prerequisites; 3) provide students with a clear idea of expectations for student success; 4) establish a philosophy and foster a culture that values continuous review and improvement; 5) create your own examinations, lesson plans, presentations, and course materials using multiple current references; 6) emphasize EMT-Basic concepts throughout the class; 7) use frequent case-based classroom scenarios; 8) expose students to as many prehospital ALS patient contacts as possible, preferably where they are in charge; 9) create and administer valid examinations that have been through a review process; 10) provide students with frequent detailed feedback regarding their performance; 11) incorporate critical thinking and problem solving into all testing; and 12) deploy predictive testing with analysis prior to certification. Fernandez AR, Studnek JR, Cone D (2009) The Association Between Emergency Medical Technician-Basic (EMT-B) Exam Score, Length of EMT-B Certification, and Success on the National Paramedic Certification Exam. Academic Emergency Medicine, 16:1–6. This study analyzed the relationship between EMT-B NREMT exam score, length of EMT-B certification, and success on the national paramedic certification exam. Both EMT-B NREMT exam score and length of EMT-B certification were significantly associated with success on the first attempt of the national paramedic certification exam. Educators may wish to consider these two factors when determining paramedic program admission standards and⁄or consider these variables when determining how to allocate program resources. Studnek J, Fernandez AR, Margolis GS (2009). Assessing Continued Cognitive Competency Among Rural Emergency Medical Technicians. Prehospital Emergency Care, 13:357-363. The primary objective of this study was to assess the continued competence of EMT-Basics practicing in low frequency environments. Participants from two rural and contiguous states were administered a validated general knowledge EMT exam. Overall, 151(63.2%) individuals met or exceeded the passing standard of the NREMT-Basic cognitive examination, with 90 (70.9%) passing in state A and 61 (54.5%) passing in state B. Individuals reported an average of 48.6 continuing education hours. A clear majority of individuals reported responding to 0 or 1 call in a typical week. A logistic regression model was constructed in which level of education and volunteer status were significantly associated with passing the examination. Lerner B, Fernandez AR, Shah MN (2009). Do EMS Providers Think They Should Participate in Disease Prevention? Prehospital Emergency Care, 13:64-70. The objective of this study is to determine EMS providers’ opinions regarding participation in disease prevention initiatives. EMS professionals reregistering in 2006 were asked to complete an optional survey regarding their opinions on and participation in disease and injury prevention. 82.7% felt that EMS professionals should participate in disease prevention; with those working 20 to 29 hours per week being the least likely to think they should participate. About a third of the respondents reported having provided prevention services. About half of the respondents agreed that prevention services should be provided during emergency calls, and 8% of the respondents reported providing prevention services during emergency calls. Studnek JR, Fernandez AR, Margolis GS, O’Connor RE (2009). Physician Oversight in EMS: Where Are We? Prehospital Emergency Care, 13:1, 53-58. This project quantified the amount of contact nationally registered EMS professionals have with their medical director. Participants indicated how often they interacted with their medical director in three specific situations (participation in continuing education, met personally to discuss an EMS issue, and saw medical director at the scene of an EMS call). Overall, 62.5% individuals reported having contact with the medical director in one of the above situations within the last 6 months. MD contact significantly increased with certification level (EMT-Basic 47.6%, EMT-Intermediate 62.3%, and Paramedic 78.5%) and varied by service type (hospital based 78.8%, county/municipal 70.8%, private 67.6%, military 62.4%, government 61.1%, fire based 57.0%, and volunteer 50.8%). EMS professionals working in urban areas were more likely to report recent MD contact than those in rural areas (64.9% vs. 59.2%). Studnek JR and Fernandez AR (2008). Characteristics of Emergency Medical Technicians Involved in Ambulance Crashes. Prehospital and Disaster Medicine, 23(5): 432-37. This study utilizes a national sample of Emergency Medical Services (EMS) professionals to explore the demographic and work related characteristics associated with involvement in ambulance crashes. 8.6% of the EMS professionals surveyed being involved in an ambulance crash within the past 12 months. When controlling for call volume and time in an ambulance, the odds of involvement in an ambulance crash within the past year were significantly higher for younger EMS professionals and those reporting sleep problems. Studnek JR and Fernandez AR (2008). Organizational Description and Emergency Preparedness of Nationally Registered First Responders. Prehospital and Disaster Medicine, 23(3): 250-255. This project resulted from the analysis of Nationally Registered First Responders (NRFR) re-registering in 2006. The majority (75%) of NRFR performed work in rural areas and work for fire departments (61%). More than a quarter of NRFRs received no training in the management and treatment of patients involved in biological, chemical, nuclear, explosive emergencies, or structural collapse within the past 24 months. Margolis GS, Studnek JR, Fernandez AR, Mistovich J (2008). Strategies of High-Performing EMT-Basic Educational Programs. Prehospital Emergency Care 2008, 12:206-211. 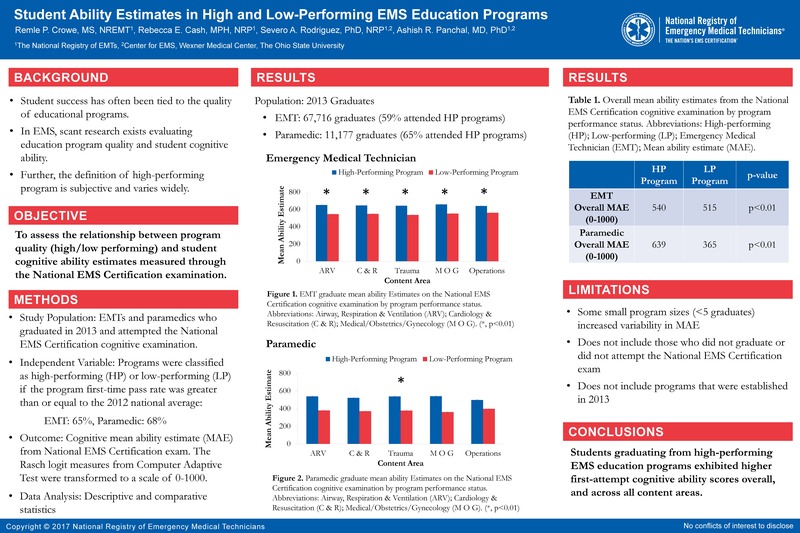 A nominal group technique was used to identify the specific strategies used by high-performing EMT-Basic programs to maintain high first time pass rates. From these, the following seven recommendations to improve pass rates on the NREMT certification exam were derived: 1) secure strong institution support, 2) hire well qualified EMT lead instructors, 3) strive for instructional consistency 4) recruit students who are positively motivated to succeed, 5) admit students who have demonstrated that they have the academic skills necessary to complete the course, 6) develop student test taking skills, and 7) establish a course passing standards that exceed minimum competency. Fernandez AR, Studnek JR, Margolis GS (2008). Estimating the Probability of Passing the National Paramedic Certification Examination. Academic Emergency Medicine 2008, 15:258-264. The objective of this study was to utilize student and program characteristics to build a multivariable logistic regression model to determine the probability of success on the cognitive portion of the national paramedic certification exam. 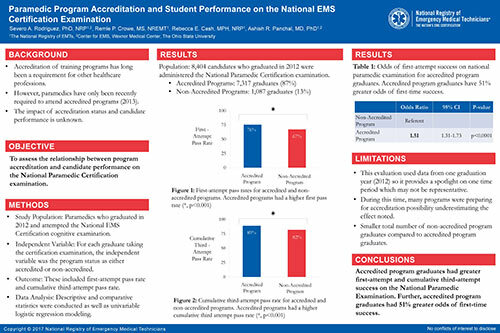 Two programmatic characteristics (national accreditation and instructor qualification), six student characteristics (high school class rank, years of education, required for employment, age, race, and gender), and one graduate characteristic (estimated time since course completion) had a significant effect on the probability of passing the national paramedic certification examination. A change in either of these variables can increase or decrease a student’s probability of passing the exam. Russ-Eft DF, Dickison PD, Levine R (2008). Examining Career Success of Minority and Women Emergency Medical Technicians (EMTs): A LEADS Project. Human Resource Development Quarterly, vol. 19, No. 4. This study examined the factors that related to objective and subjective career success. Education, experience, and hours worked predicted objective career success, while satisfactions with others and supervisor predicted subjective career success. Minority status was not related to either objective or subjective career success. Gender was unrelated to subjective career success, but negatively influenced objective success. Studnek JR, Ferketich A, Crawford JM (2007). On the Job Illness and Injury Resulting in Lost Work Time Among a National Cohort of Emergency Medical Services Professionals. American Journal of Industrial Medicine 2007, 50(12):921-931. This study estimated the prevalence and incidence of job-related illness or injury resulting in lost work time of Emergency Medical Services (EMS). The prevalence of job-related illness or injury with time away from work was estimated at 9.4%, with a one-year incidence estimated at 8.1 per 100 EMS providers. It appears that increasing call volume, an urban work environment and a history of back problems were associated with increased reporting of job-related illness or injury. Studnek JR, Ferketich A (2007). Organizational Policy and Other Factors Associated with Emergency Medical Technician Seat Belt Use. Journal of Safety Research, 2007;38(1):1-8. As part of biennial re-registration paperwork, nationally registered EMTs were asked to describe their seat belt use while in the front seats of an ambulance. A logistic regression model was fit to estimate the association between seat belt use, organizational seat belt policy, type of EMS organization worked for, EMT certification level, and the size of community where EMS work is performed. Of the 41,823 EMTs that re-registered in 2003, surveys were received from 29,575 (70.7%). Participants reporting no organizational seat belt policy had lower odds of seat belt usage when compared to individuals that do have a seat belt policy. Paramedics and those working in rural areas also had lower odds of seat belt use. Several factors were found to be associated with seat belt usage among EMTs however, it appears that only one, organizational policy, is a modifiable characteristic. Markson D. Tunik M. Cooper A. Olson L. Cook L. Matza-Haughton H. Treiber M. Brown W. Dickinson P. Foltin G. (2007). A National Assessment of Knowledge, Attitudes, and Confidence of Prehospital Providers in the Assessment and Management of Child Maltreatment. Pediatrics, 119,1:e103-e108. Studnek JR, Crawford JM (2007). Factors Associated With Back Problems Among Emergency Medical Technicians. American Journal of Industrial Medicine, 2007;50(6):464-469. This project evaluated the association between back problems and individual and work-related characteristics. EMTs dissatisfied with their current assignment were 9 times more likely to report back problems that those who are satisfied. EMTs reporting good or fair fitness were more than 3 times more likely to experience back problems than those with excellent fitness. Results from this analysis suggest that there are two modifiable factors associated with self-reported back problems among EMTs, satisfaction with current assignment and self-reported physical fitness. Dickison PD, Hostler D, Platt TE, Wang H (2006). Program Accreditation Effect on Paramedic Credentialing Examination Success Rate. Prehospital Emergency Care, Apr-Jun 2006; vol. 10, no. 2. This study described the relationship between completion of an accredited paramedic educational program and achieving a passing score on the National Registry Paramedic Certification Examination. Students who attended an accredited program were more likely to pass the examination. Attendance at an accredited training program was independently associated with passing the examination even after accounting for confounding demographic factors. Russ-Eft DF, Dickison PD, Levine R (2005). Instructor Quality Affecting Emergency Medical Technician (EMT) Preparedness: A LEADS Project. International Journal of Training and Development, 9:4. Secondary analysis of the LEADS database, examined the effects of instructor quality on the level of preparedness of EMS personnel. Results showed significant differences in the student ratings of ten dimensions of EMS instructor preparedness (trauma patient assessment, medical patient assessment, cardiac arrest management, airway management, spinal immobilization, fracture management, hemorrhage control, childbirth, pediatric patient management, patient transport) for both EMT Basics and EMT Paramedics. Pirrallo RG, Levine R, Dickison PD (2005). Behavioral Health Risk Factors of U.S. Emergency Medical Technicians: The LEADS Project. Prehospital and Disaster Medicine, Jul-Aug 2005; vol. 20, no. 4. Brown WE, Margolis GS, Levine R (2005). Peer Evaluation of the Professional Behaviors of EMTs. Prehospital and Disaster Medicine, Mar-Apr 2005; vol. 20, no. 2. This study used a peer evaluation methodology to assess the affective competencies of practicing EMS providers. EMT-Basics and paramedics rated their partners with respect to 11 categories of professional behavior. Overall national registered paramedics rated their partners significantly lower than did nationally registered EMT-Basics. Experienced EMT-Basics rated their partners significantly lower than did newer EMT-Basics. Those EMS professionals who indicated high satisfaction with their current EMS assignment rated their partners more highly on professional behaviors than did those who were not as satisfied. Overall, the peer evaluation of professional behaviors was “good”. Brown WE, Dawson DE, Levine R (2003). Compensation, Benefits, and Satisfaction: The Longitudinal Emergency Medical Technician Demographic Study (LEADS) Project. Prehospital Emergency Care 2003, 7:357. This study describes the compensation, benefit package and level of satisfaction with the benefits of nationally registered emergency medical technicians using the Longitudinal Emergency Medical Technician Demographic Study. 86% of compensated EMT-Basics and 85% of compensated paramedics were employed primarily as patient care providers. Mean earnings for EMT-Basics was $18,324 and for paramedics was $34,654. At least 26% of compensated EMT-Basics and 9% of paramedics had no health insurance. The majority of nationally registered EMS professionals reported that their retirement plans were not adequate to meet their financial needs. EMS professionals are not satisfied with the appreciation and recognition they receive from their employers. One third are not satisfied with the benefits they receive and nearly all believe that EMS professionals should be paid more for the job they do. Dawson DE, Brown WE, Harwell TS (2003). Assessment of Nationally Registered Emergency Medical Technicians Certification Training in the United States: The LEADS Project. Prehospital Emergency Care, 7:114-119. This study describes the adequacy and characteristics of emergency medical services education as assessed by surveying a stratified random sample of nationally registered EMT-Basics and paramedics. EMT-Basics and paramedics were satisfied and felt well prepared by their certification courses. Opportunities to improve certification training exist, particularly related to childbirth and pediatric patient management. Brown WE, Dickison PD, Misselbeck WJ, Levine R (2002). Longitudinal Emergency Medical Technician Attributes and Demographics Study (LEADS): An Interim Report. Prehospital Emergency Care, 6:433-439. This was an interim report of The Longitudinal Emergency Medical Technician Attributes and Demographics Study. This report describes many characteristics of nationally registered EMT-Basics and Paramedics including the educational level, gender, racial and ethnic makeup, marital status, and level of practice. Median income and median years worked in the profession were also among the many characteristics described in this report. The objective of the Longitudinal EMS Attributes and Demographics Study (LEADS) is to describe the attributes and demographic information that accurately reflect the individuals providing emergency medical services throughout the United States and changes over time. The LEADS project is a longitudinal study project hosted by the National Registry of Emergency Medical Technicians (NREMT). It is designed to describe the attributes and demographic information that accurately reflect the individuals providing emergency medical services throughout the United States. The project began in August 1998 and is led by a team of researchers including State EMS Directors, State EMS Training Coordinators, EMS System Managers, Emergency Physicians, EMS Educators, survey researchers, and staff of the NREMT. Longitudinal data and cross sectional data are collected annually. Data collected will allow for description of the EMT population, their work activities, working conditions, and job satisfaction. Most importantly, these data permit longitudinal analyses in addition to cross sectional data analyses gained from snapshot surveys. The second LEADS project (LEADS II) began in 2013 and is set to reach completion in 2022. A cohort of over 4,000 newly-certified EMTs and Paramedics opted into this study. Each year this cohort receives an electronic questionnaire with the goal of making comparisons over time. Additionally, a census survey of all nationally-certified providers is conducted annually to assess a focused EMS topic. The first ten-year LEADS project (LEADS I) began in August 1998 and was led by a committee made up of State EMS Directors, State EMS Training Coordinators, EMS System Managers, Emergency Physicians, EMS Educators, survey researchers, and staff of the NREMT. Longitudinal data and focused cross-sectional data were collected annually from a cohort of EMTs and Paramedics.